Washington is looking to wrest a large chunk of the Indian arms and ammunition market from Moscow, which has long been India's strategic partner. India is among the leaders in terms of defence purchases. New Delhi is expected to increase its defence budget by 54 percent by 2021 to $200 billion, according to IHS Jane's. 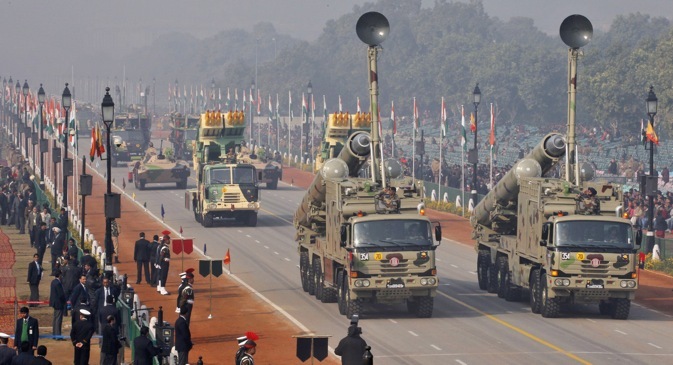 New Delhi wants its domestic defence industry to be able to produce the full range of advanced high-tech weaponry that its armed forces might require. It is no secret that New Delhi and Beijing have long regarded themselves as not only regional but global leaders. That is why they want to measure up to the United States as opposed to their regional neighbours in terms of their defence capability. Witness, for example, their energetic efforts to develop an aircraft-carrying capability and strategic nuclear forces, as well as their ambitious space militarisation programmes. Given the fact that India has a big defence budget, the country has become a strategically important market for the global arms and ammunition industry. This has made America bend over backwards to win important contracts in India. In 2011, Washington went as far as dropping several Indian defence companies and institutions - including the Defence Research and Development Organization (DRDO) and the Indian Space Research Organization (ISRO) - from its weapons export control list. The United States hopes the move will help it to forge closer defence industry cooperation with India. It is even prepared to invite New Delhi to take part in the development of the F-35 light 5th-generation fighter, and to share the technology for the Apache, its most advanced attack helicopter. Washington hopes that these inducements will be enough to wrest a large chunk of the Indian defence market from Moscow, which has long been India's strategic partner. The Europeans, meanwhile, have not been idle, either. France’s Dassault Aviation has won a $12 billion Indian tender for 126 light fighter jets, and agreed to launch their production under licence in India. European companies are also bidding for a South Korean Air Force contract, offering similar terms. “This was only to be expected,” says Ruslan Pukhov, head of the Center for Analysis of Strategic and Technologies (CAST). “We have grown used to the idea that India buys lots of cheap Russian weaponry. But Indian GDP has been growing at a 9 percent rate in recent years; the country now has the money to spend, and it wants to buy advanced systems. We have many gaps in our high-tech product range. As a result, the Indians are turning to European and American suppliers." Moscow has already lost the Indian tender for transport aircraft. It offered the Il-76 model, but the Indians opted instead for the C-130J-30 Super Hercules. New Delhi has paid almost $1 billion for a batch of six planes; the figure is astronomical, especially given that the Il-76 would have cost them a lot less. But it appears that price was not the only consideration; the Indians must have taken into account the outcome of the Russian-Chinese contract for 40 Il-76 transports signed back in 2005. Russia promised to supply the aircraft for a total of $1 billion, but never managed to build them. None of the Russian aerospace companies has actually managed to launch mass production of the Il-76 model. Moscow probably hoped to use the deposit paid by China to move the existing Il-76 production facilities from the Tashkent plant in neighbouring Uzbekistan to its own aerospace production complex in Voronezh, and then to Ulyanovsk - but it appears that the plan fell through for some reason. Are we losing out on the Indian market? Russia has also lost several other foreign contracts for fighter jets and attack helicopters, and for similar reasons. Its Mig-35 fighter and Mi-28N helicopter are superior to anything Russia’s competitors have to offer in terms of sheer performance. But there is only a single existing prototype of the MiG-35. The Mi-28N has entered mass production, but the new model is still struggling with teething technical problems. Clearly, India does not want to pay for a product that is not quite ready for prime time. It has already made that mistake, and on more than one occasion; suffice is to recall the contracts for the Uragan SAM systems, which are used on India's Talwar-class frigates; the Smerch multiple-launch rocket systems; and the Vikramaditya aircraft carrier. Another example is the Nerpa nuclear-powered submarine. Moscow agreed a lease deal for the sub with the Indians several years ago, but the delivery date was pushed back on several occasions [before the submarine was finally delivered in 2012]. Anatoliy Isaykin, head of the Russian defence export intermediary Rosoboronexport, insists, however, that things are not all that dire. He says that the Asia-Pacific now accounts for more than half of the company's deliveries. In recent years Russia approved about $7 billion worth of export loans under weapons contracts. This has enabled Rosoboronexport to sign new deals with Myanmar, Malaysia, Indonesia, Sri Lanka and Vietnam. Moscow is determined to keep its share of the Indian defence market and to retain its status as the world's second-largest defence exporter. Last year Rosoboronexport signed $17.6 billion worth of new contracts, which represents an increase of 150 percent compared to 2011. The company's portfolio of contracts has reached an impressive $37.3 billion.